Stinson & Company is a locally owned and operated company located in historic Portland, Maine. 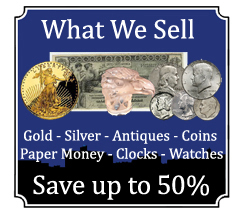 We specialize in the sale of gold, silver, coins, watches, antiques and collectables. 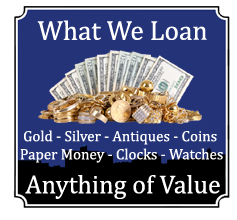 We are not your typical pawn shop so stop by today and see our store. Buying from us will save you time and money. 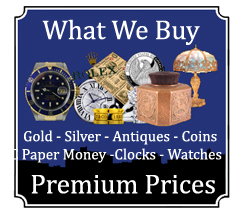 We always have some of the most interesting items and our inventory changes from week to week. Check out our ebay store for great objects at fantastic prices. Inventory changes daily, so check back often. Fantastic ultra rare Early 20th Century four foot Old Town salesman sample canoe. Old town Canoe was known for their construction and this model has outstanding ribbed interior framework and attached seats. Exterior is deep forest green with yellow pinstripes stenciled “Old Town Canoe”. Canoe retains original decal on the wood frame. This does have crazing to original painted surface with various chips to paint. The wood frame has a great original patina from the years and has no breaks or repaired damage. Measures: 48′ L x 9′ W. These factory display samples, often called a 'salesman's sample' though they were really meant to be hung or displayed in retail shops. They were given to only the largest and best dealers. This is a great investment quality object that should no be overlooked.